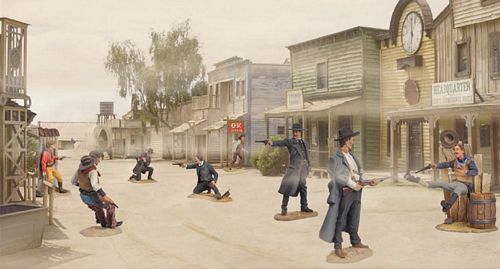 The famous gunfight at the O.K. Corral is surely a great example of the decisive role played by the movie industry in building up popular myths. Starting with the John Ford epic “My Darling Clementine”, the subject would be revisited by many others films recreating the famous feud between the “law” and the “outlaws.” These terms were vaguely defined at the time. That feud inevitably ended in an approximately 30 second gunfight at about 3:00 pm on October 26, 1881 in a remote little mining town in Arizona called Tombstone. Even though many accounts on this gunfight have been written over the years, the reasons for the fight remain rather foggy still today. Basically, it was the result of harsh enmity between three brother clans: the Earps backed by Wyatt’s close friend and admirer Doc Holliday (the law), against the Clantons and the McLaurys (known at the time as “the cowboys”). This Black Hawk presentation is a depiction of the fight’s 30 seconds - climax resulting in 3 men killed (Billy Clanton and Frank and Tom Mc Laury) 3 wounded (Virgil and Morgan Earp and Doc Holliday) and two without a scratch (Ike Clanton and Wyatt Earp).